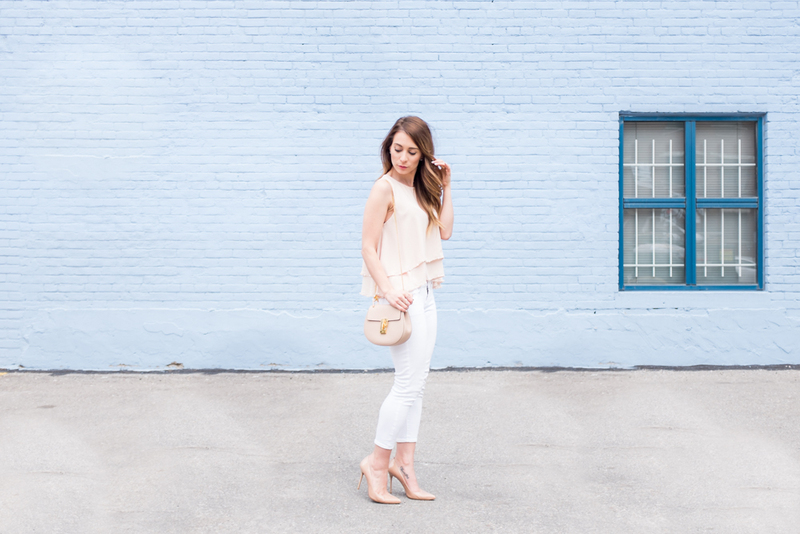 OOTD - White and Peach | La Petite Noob | A Toronto-Based Fashion and Lifestyle Blog. Even though the weather outside is anything but Spring, my wardrobe choices of late have been light and airy. White denim seems to be my pant of choice, and I love pairing my jeans with a light top and accessories. This peach shirt is perfect for spring - the colour is amazing, the loose fit makes it so easy and the bottom is adorned with pearls! I picked up this shirt at Lemonberry, a boutique in Aurora, Ontario after participating in their Spring photoshoot (more photos to come.) The details of this top make it so unique, and it just adds to the argument of why you should shop at boutique stores. Paired with light accessories, I'm ready to take on the much-anticipated warm spring weather. Anytime now, Mother Nature. Anytime. I'll admit that I usually suffer from huge buyers remorse when investing in luxury items, but the Chloe Drew bag had me at 'hello.' I'm absolutely loving the retro silhouette and the colour is the perfect compliment for a lighter wardrobe palette. While the chain strap isn't for everyone, it's one of my favourite features of the bag and I've worn comfortably all day without any issues. No buyers remorse here, only excitement for the weather to warm up so that I can take this baby out of the closet more often! I spy a beautiful vintage ring on my middle finger! I picked up this unique treasure from Miaou Vintage this past weekend, and love the unique addition to my collection. I'm not one to have any luck while vintage shopping, so I appreciate how Miaou curated a collection that seems to have my name all over it. Definitely check them out! What do you guys think? Do you have beautiful weather where you are, or is it still chilly like in Toronto? What is your colour palette for Spring? Let me know! These soft colours look so beautiful on you, and I love how the wall matches the pastel effect you're going for! Thank you so much Siffat! Gotta love a blue wall, LOL! Love these colours on you; you look radiant in peach! Those accessories are stunning. Great ring party! Twinsies! Well you know I love this look already lol. Looks great on you as well, but hellooooo Drew! Twinning hard, if only I had the beautifully distressed jeans that you wore! 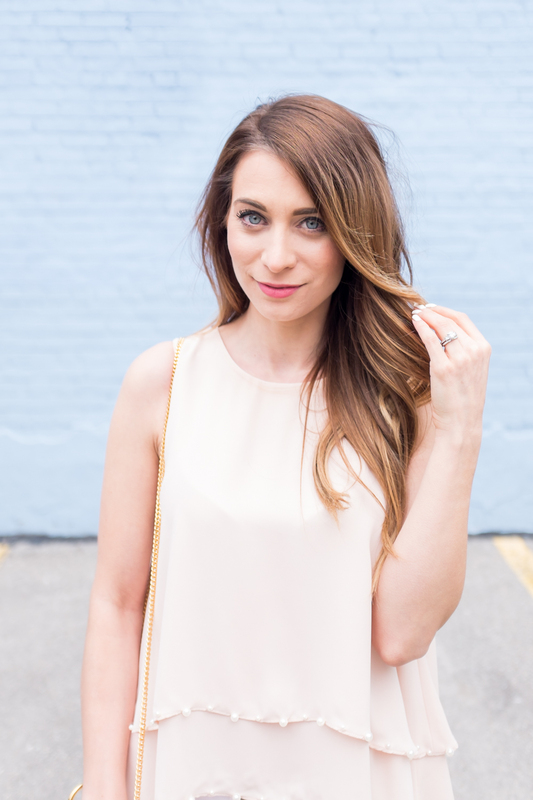 The color of both your top + bag are gorgeous, love! Thank you so much Kierra! I can't get enough of soft pinks lately. The detail on that top is amazing! I totally agree, although it looks like this weekend is going to be a beauty. Can't wait!! It actually snowed here this week...so it's definitely not feeling like spring. I've been trying to make the most of it by wearing as many spring colors as I can though. The Chloe bag is definitely to die for and absolutely suits your look perfectly. Love your hair and makeup as well, btw! Thank you so much Bella! Looks like the weather here is warming up, hopefully it is for you too! Thanks so much Filipa, I love the purse too! Now I am slightly less afraid of it, so it makes more regular appearances LOL!